Amazing debut - part James Bond, part Jasper Fforde, this book is funny, quirky, and very different. One of the best/most interesting openings I've read in a while. If you can stop reading after the first chapter you're a stronger person than I. A smart funny thriller about Her Majesty's supernatural secret service, that is -- thankfully -- the first of an upcoming trilogy. Myfanwy Thomas, the title character, is smart, feisty and has extraordinary powers, which come in mighty handy. 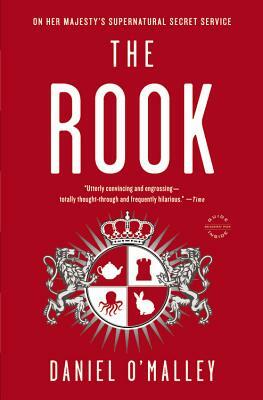 The rook -- one of two, along with bishops, chevaliers, pawns and retainers -- battle whatever supernatural enemy rears it's ugly head, for queen and country...hopefully without queen or country ever knowing. This is a compelling read that will leave you anxiously waiting for the second installment. X-Files meets James Bond meets the more bureaucratic elements of Harry Potter. Eh, maybe with a little League of Extraordinary Gentleman and Rick & Morty thrown in there. I could not stop reading, not even after laughing so hard that I choked while riding the bus.